LAS VEGAS, NV–(Marketwired – Jun 12, 2014) – Alkame Holdings, Inc. (OTCBB: ALKM) (OTCQB: ALKM), a health and technology holding company with a focus on patentable, innovative, and eco-friendly consumer products, is pleased to announce that it has initiated a Muscle Recovery Research Study utilizing its patented and proprietary micro-clustered, alkaline, antioxidant, and oxygenated bottled water. The comprehensive research study will be conducted in partnership with several leading professional Mixed Martial Arts companies and has been designed to provide further real world data and documentation of the sports performance and recovery benefits of drinking Alkame bottled water. The Muscle Recovery Research Study has been developed and will be overseen by the Alkame Science and Technology Advisory Group, consisting of Tammy Schaible Miller, Dr. Pietro Baio, and Andrea Visak, with the assistance of MMA United Sports Entertainment Group and will include separate athlete groups from two elite level MMA training camps, The MMA Lab (Efrain Escudero, Jocelyn Jones-Lybarger, Lauren Murphy, Yaotzin Meza) in Glendale, Arizona, and The Daru Fitness & Performance Camp (Phil Daru) in Port St. Lucie, Florida. The research study is expected to include extensive monitoring of several key athletic performance and recovery factors, including lactic acid and urine pH levels, heart rate, body temperature, and blood pressure. 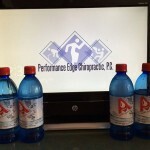 Of particular interest to elite level MMA athletes will be the effectiveness of Alkame bottled water at providing rapid hydration during all critical stages of pre-fight preparation (training/weight cutting), competition, and post-fight recovery. The Alkame Muscle Recovery Research Study is scheduled to begin the week of June 16, 2014, and is expected to take 4-6 weeks to complete, at which time the data will be compiled and evaluated prior to public disclosure. Alkame Holdings, Inc. is a publicly traded health and technology holding company with a focus on patentable, innovative, and eco-friendly consumer products. The Company’s wholly-owned subsidiary, Alkame Water, Inc., markets and distributes micro-clustered, alkaline, antioxidant and oxygenated bottled water utilizing an exclusive patented formula and technology. Alkame’s patented technology creates water with several unique properties which allow the body to absorb and utilize it more efficiently and help to achieve an optimal pH balance. The patented Alkame technology also increases the available oxygen content and absorbability which equates to more fuel for improved metabolic efficiency, boosted immune system, and improved cardio respiratory function. Disclaimer/Safe Harbor: This news release contains forward-looking statements within the meaning of the Securities Litigation Reform Act. The statements reflect the Company’s current views with respect to future events that involve risks and uncertainties. Among others, these risks include the expectation that the Muscle Recovery Research Study will yield positive results, the failure to meet schedule or performance requirements of the Company’s contracts, the Company’s liquidity position, the Company’s ability to obtain new contracts, the emergence of competitors with greater financial resources and the impact of competitive pricing. In the light of these uncertainties, the forward-looking events referred to in this release might not occur. These statements have not been evaluated by the Food and Drug Administration. These products are not intended to diagnose, treat, cure or prevent any disease.